"Never walk away from what God has given you to do"
Never focus on what it appears to be. Those are a few things you will hear from Pastor Cliff Coward, pastort of Agape International Ministries Worlwide in Richmond, Virginia. 21 years ago he heard from God and started a ministry in his living room with just his family. 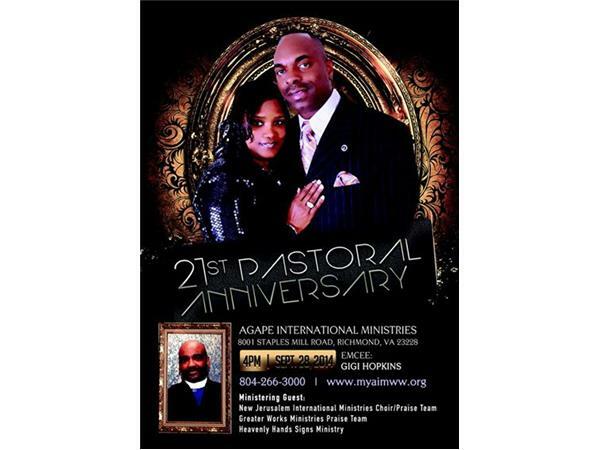 Today, Pastors Cliff & Vicki Coward are celebrating 21 years in ministry. From the living room to the book store, to the building on Hull Street, to their current location in the West End of Richmond, Virginia. A clear example of listening,leaning,trusting and depending on God. Join us, as we chat about his journey. It was never easy, but it was worth it.